My little box of samples has been dwindling a lot since my last sample stash post! I've been on a bit of a spending ban, which has been great for finally getting through some of the mini products that have been waiting for me. 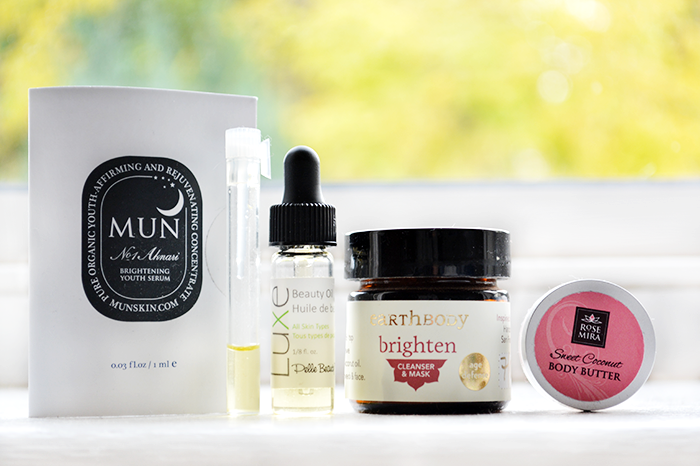 All the samples I'm mentioning in this post are from various Petit Vour monthly vegan beauty boxes* - it's quickly become one of my favourite subscription services! After seeing plenty of rave reviews, I was excited to try out a tiny 1ml sample of the MUN No.1 Aknari Brightening Youth Serum. To be completely honest, I was kind of underwhelmed. I liked how lightweight the serum is, absorbing into the skin really quickly, but if anything my skin looked more lackluster than usual and it just didn't wow me. Obviously 3 days of using a skincare product isn't really long enough to get a proper idea of performance, but initially I'm not convinced a 20ml bottle is worth the $95 (approx. £60) price tag. The Pelle Beauty Luxe Beauty Oil on the other hand totally impressed me after just the first use! I used it as my nighttime face oil and saw a noticeable difference with my skin seeming brighter and softer by the morning. I'm quite fussy with scents though and I'm not overly keen on this scent as it's quite distinctive, but I did get used to it after a few uses (or maybe I just didn't mind as much when the product performs so well)! There seems to be a bit of a theme of brightening skincare products here... the next sample I've been testing is Earthbody Brighten Cleanser & Mask. It comes in powder form and can be used as a daily cleanser mixed with water or weekly face mask mixed with water, agave nectar and coconut oil. This leaves my skin feeling surprisingly hydrated and most definitely brighter! The final sample, Rosemira Sweet Coconut Body Butter, is probably my favourite of the bunch! It smells amazing, like coconut and vanilla with a hint of orange - seriously good! This body butter is rich and nourishing and a little really goes a long way. It's a little oily at first and takes a few minutes to properly soak in but it's so worth it for the extra hydration and that amazing tropical scent! I want to try these all! What a lovely Petit Vour box. The Pelle Beauty Luxe Oil sounds good, I really want to try something like that for my skin. That's also good if you get used to the scent as that can really put you off a product even if it's good. Lovely photo Ria! I'm really enjoying the Earthbody Brighten Cleanser.